A Cardboard Problem: Is this Heaven? Great selection there. 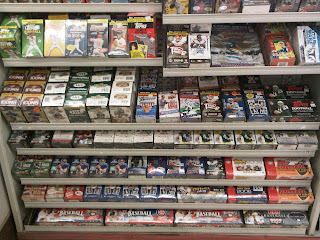 Has anyone else noticed (at least up here in North Jersey), all the 09 Topps Series 1 blasters have disappeared. I've checked 3 K-Marts and 2 Targets, there are none to be found. I agree, I have 2 local Targets and neither have had 09 Topps blasters in the longest. There are plenty of 08 Topps blasters. I was actually hoping to find an 09 Topps Series 2 blaster today but just loose packs here. I don't see a single 2009 product. It pretty much looks like my Kmart's selection except it is much, much, MUCH neater. But yeah, not much '09 there, if at all. I'm doing pretty well in my neighborhood with the '09 stuff lately. Target and even Wal-Mart are keeping up with things. Series 2 stuff was out almost instantly. I took that picture two weeks ago. I'll go back tomorrow and get an update to see if their is any 2009 product. My version of heaven doesn't have wrestling cards in it.